Read the Patient Information that comes with LATISSE™ before you start using it and each time you get a refill. There may be new information. This leaflet does not take the place of talking with your physician about your treatment. Who should NOT take LATISSE™? Are there any special warnings associated with LATISSE™ use? LATISSE™ solution is intended for use on the skin of the upper eyelid margins at the base of the eyelashes. Refer to Illustration 2 below. DO NOT APPLY to the lower eyelid. If you are using LUMIGAN® or other products in the same class for elevated intraocular pressure (IOP), or if you have a history of abnormal IOP, you should only use LATISSE™ under the close supervision of your physician. 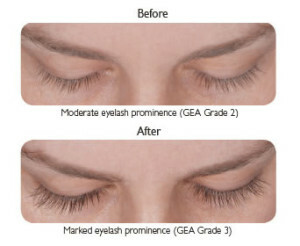 LATISSE™ use may cause darkening of the eyelid skin which may be reversible. LATISSE™ use may also cause increased brown pigmentation of the colored part of the eye which is likely to be permanent. It is possible for hair growth to occur in other areas of your skin that LATISSE™ frequently touches. Any excess solution outside the upper eyelid margin should be blotted with a tissue or other absorbent material to reduce the chance of this from happening. It is also possible for a difference in eyelash length, thickness, fullness, pigmentation, number of eyelash hairs, and/or direction of eyelash growth to occur between eyes. These differences, should they occur, will uually go away if you stop using LATISSE™. Who should I tell that I am using LATISSE™? LATISSE™ solution is an ophthalmic drug product. LATISSE™ is not expected to cause harm if it gets into the eye proper. Do not attempt to rinse your eye in this situation. If you develop a new ocular condition (e.g., trauma or infection), experience a sudden decrease in visual acuity, have ocular surgery, or develop any ocular reactions, particularly conjunctivitis and eyelid reactions, you should immediately seek your physician’s advice concerning the continued use of LATISSE™ solution. If you stop using LATISSE™, your eyelashes are expected to return to their previous appearance over several weeks to months. Any eyelid skin darkening is expected to reverse after several weeks to months. Any darkening of the colored part of the eye known as the iris is NOT expected to reverse and is likely permanent. LATISSE™ solution is packaged as a 3 mL bottle of solution with 60 accompanying sterile, disposable applicators. The recommended dosage is one application nightly to the skin of the upper eyelid margin at the base of the eyelashes only. Once nightly, start by ensuring your face is clean, makeup and contact lenses are removed. Remove an applicator from its tray. Then, holding the sterile applicator horizontally, place one drop of LATISSE™ on the area of the applicator closest to the tip but not on the tip (see Illustration 1). Then immediately draw the applicator carefully across the skin of the upper eyelid margin at the base of the eyelashes (where the eyelashes meet the skin) going from the inner part of your lash line to the outer part (see Illustration 2). Blot any excess solution beyond the eyelid margin. Dispose of the applicator after one use. DO NOT APPLY in your eye or to the lower lid. ONLY use the sterile applicators supplied with LATISSE™ to apply the product. If you miss a dose, don’t try to “catch up.” Just apply LATISSE™ solution the next evening. Fifty percent of patients treated with LATISSE™ in a clinical study saw significant improvement by 2 months after starting treatment. If any LATISSE™ solution gets into the eye proper, it is not expected to cause harm. The eye should not be rinsed. Don’t allow the tip of the bottle or applicator to contact surrounding structures, fingers, or any other unintended surface in order to avoid contamination by common bacteria known to cause infections. Contact lenses should be removed prior to application of LATISSE™ and may be reinserted 15 minutes following its administration. 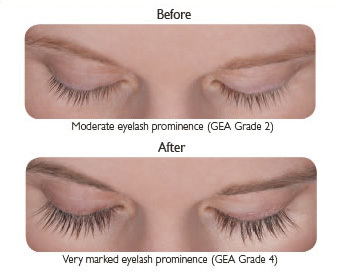 Use of LATISSE™ more than once a day will not increase the growth of eyelashes more than use once a day. Store LATISSE™ solution at 36 degrees to 77 degrees F (2 degrees to 25 degrees C). Prescription treatments are sometimes prescribed for conditions that are not mentioned in patient information leaflets. Do not use LATISSE™ solution for a condition for which it was not prescribed. Do not give LATISSE™ to other people. It may not be appropriate for them to use. This leaflet summarizes the most important information about LATISSE™ solution. If you would like more information, talk with your physician. You can also call Allergan’s product information department at 1-800-433-8871. Active ingredient: bimatoprost. Inactive ingredients: benzalkonium chloride; sodium chloride; sodium phosphate, dibasic; citric acid; and purified water. Sodium hydroxide and/or hydrochloric acid may be added to adjust pH. The pH during its shelf life ranges from 6.8 – 7.8. Product available for sale here. ™ and ® marks owned by Allergan, Inc.